When one lives in an old house, as I do, it's not hard to find a few curios sprinkled around. The house I live in dates from the early 1900s and it's been remodeled several times, most significantly in the mid 1940s to early 1950s. There is evidence of many interesting things having been removed as time wore on and more modern technology came along: a covered opening into the chimney stack in the kitchen for some sort of woodburning stove, various standpipes that were presumably for hand pumps that seem likely to have been connected to a cistern and the remants of a rainwater collection system with a diverting valve meant to send water into the storm sewer or off to the cistern. All that's getting waaaay off the subject, though. I've long been curious about this transformer's age and possible purpose (beyond the obvious). I'd love to know approximately how old it might be, and that's a lot of the reason why I decided to throw this page up and see if anyone might write in with more information. It's worked before! There's not a whole lot of information to be found online about Jefferson Electric. Roger Russell's web pages about Jefferson's line of mystery clocks are about it. Google's book scanning project has collected a lot of interesting history. With a bit more trawling than I'd done at first, some advertisments and pictures of the Junior Bell Ringer I have did show up. You'll notice that the input terminal design on my example is a bit different from that shown. These date from around 1918 (or slightly before) to about 1923. 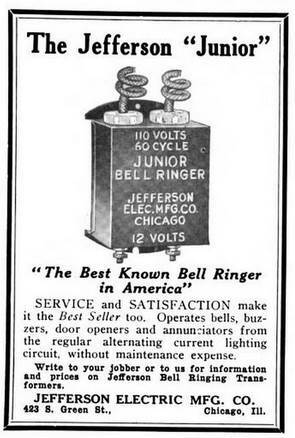 While there, I found another version of the Jefferson product and a different "junior bell ringer" product from the Viking Electric Company of New York. One might suggest asking Roger Russell if he's got any more information about the Jefferson Electric Company or this transformer, and while he might, I'm hesitant to send any e-mail that way. When I enquired of him about some projection clocks, I never got a reply and that entire portion of his web site vanished. Coincidence? Probably. The timing was too perfect, though. 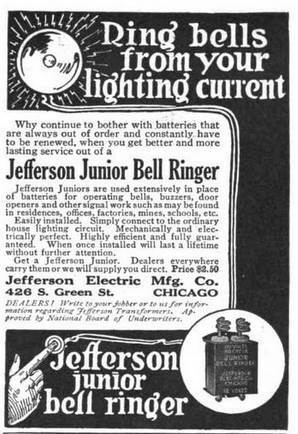 Jefferson Electric is still around today, though they've been through many hands. I can't imagine that they'd have any information about this transformer today, and so I've never contacted them to ask. In fact, about the only thing I can tell you is that it still works here in March of 2018. (Yes, it took me a long time to do that because brevity just isn't my style.) As their advertisement said, "when once installed will last a lifetime without further attention". 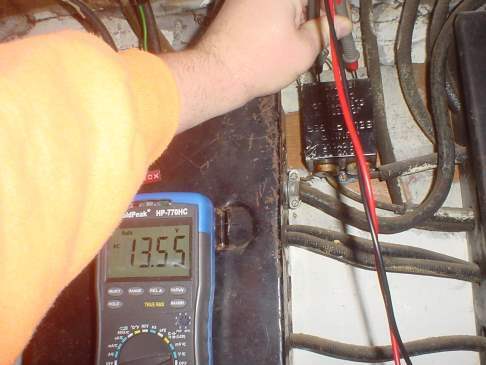 I have to wonder if it is still powering some forgotten thing within the walls of this house, as I'd expect its open circuit voltage to be much higher. 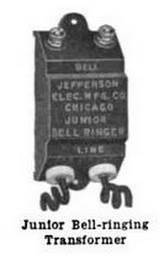 If you've come to this web page looking for more information about your own Jefferson Electric Junior Bell Ringer, I'm sorry if I have disappointed you. You might check back, though, because someone may well drop out of the shadows with more information. 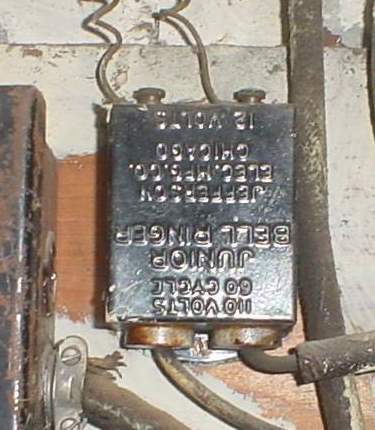 And of course, if you have some information about this transformer or the company, I'd really love to hear from you! Please feel free to send me some e-mail! Copyright © 2018 by William R. Walsh. Some rights reserved. Please review the terms and conditions governing your use or reuse of this work in whole or part, available from the top level page of this server. Created 03/17/2018, updated 04/22/2018.